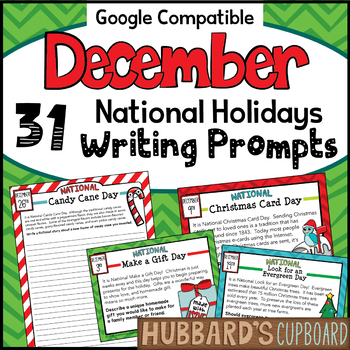 National Bake Cookies Day or National Go Caroling Day are just a few examples of the holiday the students will write about in this December activities unit. Kids love learning about the trendy and fun National Holidays. This unit has a writing prompt for each day with Google Classroom Activities / Google Slides or with a pdf. printable option. 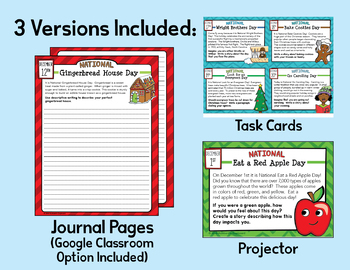 You can use them in multiple ways: Christmas activites, Daily Writing prompts, Christmas Writing Prompts, writing task cards, writing center, independent work, literacy stations, and Daily Five's - "write to self". 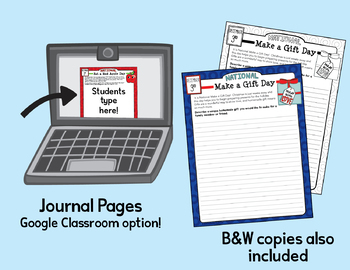 This unit was created to overcome the struggle to get upper elementary students to write creatively. When teachers can find a way to make writing relate to the student, it is a win-win for both. This writing prompt unit does just that. 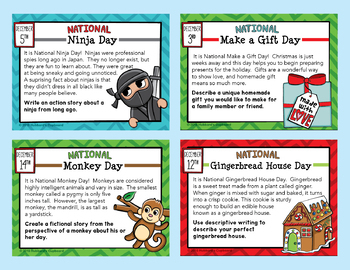 Students love the trendy National days and will look forward each day to finding out what the new holiday is for the day. The students are given a writing prompt that relates to the trivia given to them about that day's national holiday. This writing prompt can be used as morning work or it can be used in a writing station. The unit includes both “Black and White” or “Color” printout options!